The Junggle's animals are proud and fearless. Until they run into the one that scares them the most! Thus, the lion is afraid of the rhinoceros, while the hyena flees the crocodile. And the mouse scares the biggest of them all: the elephant! But don't worry: here, all animals live together without worries. Junggle is there for you to have fun with this harmony. Thanks to a system of animal wheels and order of magnitude, these round cards will create an atmosphere in all families and on all game tables! Animals are all afraid of each other, and when in doubt, their size makes the difference. 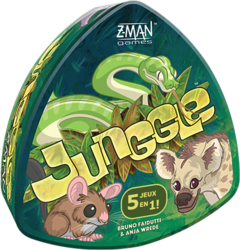 A game of memory, bluff, skill and reflexes, Junggle contains 5 games, fast and simple. First find the highest ranking animal that is not afraid, capture an animal at the waterhole, and many others that will appeal to your sense of observation or reflection. For every game desire, there is a Junggle game! Contents of the box : 45 animal cards, 9 memory cards, 1 rule booklet.